Forget the crew, Aquaphalt has the patch for you! Homeowners are tasked with a common problem during the spring and summer, as driveways and roads have been battered from winter use, plows and street salt and left to look much like a piece of swiss cheese. When you begin to think of this repair, images of large crews, heavy machinery and dollar signs may run through your head. Before you panic, Aquaphalt is here for you! Aquaphalt has been used successfully in Europe for years as the first pre-mixed, permanent repair material that is enduring, high-performing and 100% environmentally friendly. Delivering the quickest set-up time of any patching product on the market, it begins to harden right away, allowing driveways and streets to be open to traffic immediately. In any weather, on any road, with only water, Aquaphalt goes down easy! Aquaphalt is the right choice for enduring repairs. In just a few easy steps, Aquaphalt provides customers with a repair option that drastically reduces costs, environmental risks and traffic congestion. Aquaphalt can be laid directly from its container, eliminating the need for repeat repairs and steep overhead costs. First, remove all loose material from the repair area and sweep it clean. Unlike other patching products, Aquaphalt is free-flowing for ease in placement and leveling. TIP: Using a rake or shovel, level off your patch so it sits roughly an inch above the surrounding area to account for compaction. With Aquaphalt’s proprietary “green” binder, it reacts and hardens solely with water, unlike other asphalt patching products available on the market. Many of those alternatives contain toxic petroleum-base solvents with volatile organic compounds. Excess water will not damage the Aquaphalt material, so you can never use too much. Compact your Aquaphalt patch to a smooth finish with a hand-tamper or a roller. If the compacted material sinks below the level of the surrounding pavement, simply spread more Aquaphalt, water and re-compact until level. Recently, the Virginia Department of Transportation (VDOT) called upon Aquaphalt for pavement problems on Route 29. Rain was wreaking havoc during an underground waterline replacement project, inhibiting the crew’s ability to patch the construction prior to the morning commute. A contractor introduced Aquaphalt to the project to solve the problem. Crews removed the failing material and replaced it with Aquaphalt and water. The installation occurred during a 23-degree Virginia night, emphasizing the product’s versatility in wet and cold water. After visiting the site once a month to-date, VDOT officials have found absolutely no signs of pushing, shoving or rutting in the patch—common dangers associated with a weak and unstable mix. Existing repairs in Europe are more than 10 years old and still in excellent condition. 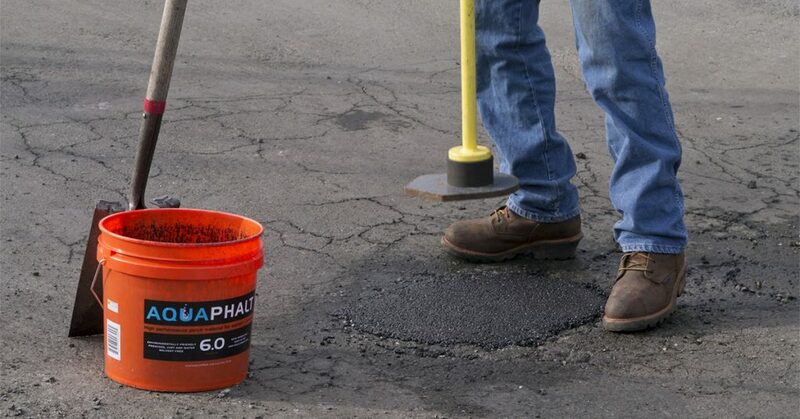 Aquaphalt is the first permanent asphalt repair available in the U.S., and it is the cost-effective solution to various repairs like potholes on driveways, pathways and tennis courts. Aquaphalt has a proprietary, plant-based binder that is completely safe to the environment, containing absolutely no VOCs. Backed by a three-year warranty and approved by DOTs in 36 states and Puerto Rico, Aquaphalt has been selected #1 in Consumer Reports for DIY Driveway Repair. Check here to learn more about the benefits of Aquaphalt today!